Our hard-rubber Kong® Goodie Toys create a winning combination of food and play that will keep dogs busy for hours. Special patented "goodie grippers" hold treats, and dogs won’t rest until they’ve gotten every morsel! Goodie Bones have classic bone shape with two goodie ports. Dog bones measure 8 1/2"L x 2 3/4"W and is 1 1/4" in the middle. Red is perfect for average chewers, and super strong Xtreme Black formula is ideal for aggressive chewers. 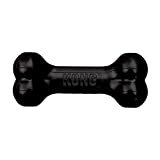 Material: Durable hard rubber Size: Large Goodie Bone measures 8 1/2"; Medium measures 7"